When a person becomes a Christian, his conduct and personality should undergo certain changes. One of these changes has to do with temper. A Christian should react in a Christian way. He should not lose his temper. This lesson will deal with the problem of anger and temper. 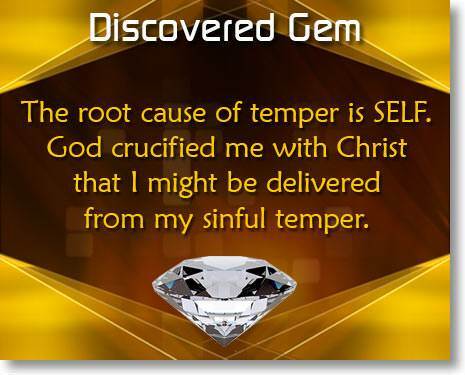 We will see the root cause of temper and learn how we can be delivered from the sin of temper. The first man to discover the destructive power of anger was Cain. Cain and his brother, Abel, were the first two sons of Adam. When these sons grew up, Cain became a farmer and Abel became a shepherd. Cain and Abel had been taught the right way to worship God. They knew that God required an offering of innocent animals as a sacrifice for their sins. But, when they came to worship God, only one brother was obedient to God. 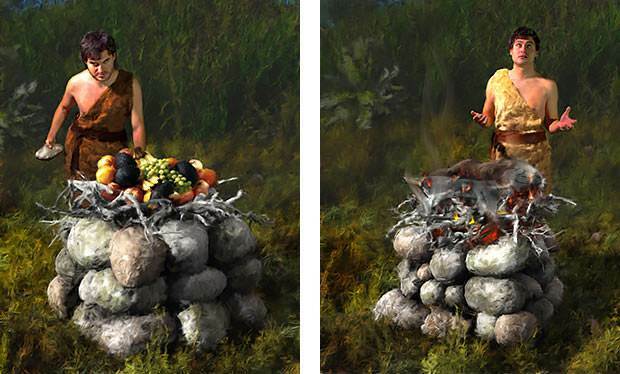 Abel brought a lamb as his offering, but Cain brought fruit from his crops as his offering. God accepted Abel and his offering, but He rejected Cain and his offering. As a result of this, Cain became very angry. He was angry at God and jealous of his brother. 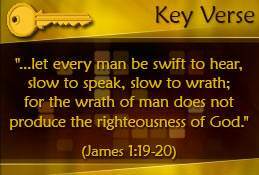 God warned Cain of the consequences of his anger. God's message to Cain was this: "Look out! Your anger is like a lion lying in wait outside your door. You must master your anger or it will master you." But Cain did not respond to God's warning. His jealousy of Abel turned into hatred. 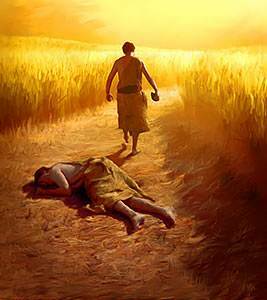 One day, as Cain and Abel were in the field together, Cain rose up against his brother and murdered him. Thus the first man born into this world became a murderer because he did not control his anger. Anger is the most violent of human emotions. Because it involves such strong feelings, anger borders closely on sin. The Bible does not say, "Be kind, but sin not," or "Love, but do not sin," because kindness and love are far removed from sin. But when we are angry, we are in danger of sinning. Someone has said, "If we are to be angry and sin not, we must be angry at nothing but sin." To suppress anger is to keep it inside. Some people lose their temper and express their anger openly. Others have the same angry feelings but manage to keep them bottled up inside. Anger that is bottled up or kept inside of us hurts and keeps on hurting. It turns to resentment and bitterness, and it can bring on depression as well as many kinds of physical illnesses. The best way to handle angry feelings is to tell God about them. This is a way to "let off steam" without sinning. God knows us better than we know ourselves, and we will always find Him to be understanding. Just being in God's presence helps to calm us. It also helps us to see things in their proper perspective. Many times we discover that the thing we were disturbed about was not really so important after all. Temper is uncontrolled anger. It is always wrong. When we lose our temper, there is but one thing to do. 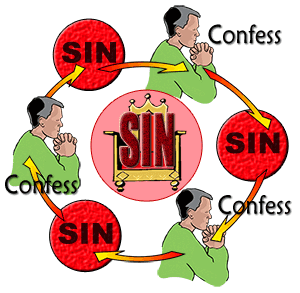 We must confess it to God as sin and claim the cleansing blood of Christ. If we have offended or hurt others, we must, of course, apologize to them. 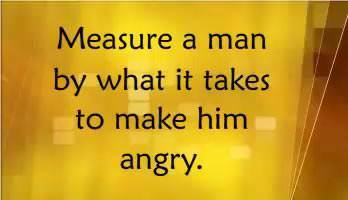 Regardless of how many times you lose your temper, you must make things right with others each time. This will humble you and help you to see the damage done by your temper. It is best not to go to the other person while you are still upset, but after you have calmed down, go and make things right. Even though we faithfully confess our sin to God every time we lose our temper, we still have a problem. The problem is that we keep doing the same thing over and over again. We lose our temper, and we confess it. Then we lose our temper again and confess it again. We do the same thing over and over. No matter how hard we try, we continue to lose our temper. Is there a remedy for this problem? Yes, there is! The first thing we must do is to discover what causes us to lose our temper. The Bible does not say much about temper. The reason is that the Bible is concerned with the root cause of temper, not just with the temper itself. What is the root cause of temper? It is SELF! Temper is produced by SELF. Whenever temper is expressed on the outside, we may be sure that there is an angry SELF on the inside. We may try hard to control our temper, but unless SELF is dealt with, we will continue to get angry and lose our temper. Let us look at a few temper-producing situations so that we may see more clearly that SELF is the cause of temper. · Someone puts us down. Being "put down" or belittled by others is one of the most common causes of losing our temper. Someone says something unkind or hurtful about us, and we become angry on the inside. Our self-pride is injured. This is but one of the many forms of SELF. · We cannot have our own way. We are self-willed and determined to have our own way. When someone crosses us and we cannot have our way, we may sulk or pout, or flare up with anger. What is the root cause of this? It is SELF. · Someone is honored above us. We like to be looked up to and admired by others. For this reason we are jealous of others when they succeed. Jealousy often turns into anger when someone gets the job or honor that we wanted. 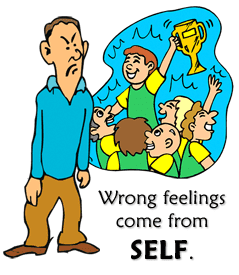 Again, the root cause of these wrong feelings is SELF. 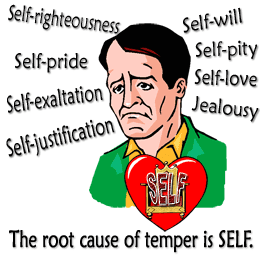 These are but a few temper producing situations, but they show us that the root cause of temper is SELF. We may not realize it, but the main reason for all our discontent is that we love ourselves and want to please ourselves. So long as we make ourselves the center of everything, we will react with anger when anyone crosses us. To sum it up, temper comes from within us. It comes from SELF. Until the problem of SELF is dealt with, the problem of temper will not be solved. NOTE: There is a self which I am to accept and a SELF which I am to deny. I am to accept myself as the special, unique person which God created me to be. But I am to deny SELF—that sinful self-life which is a form of the flesh. Because SELF is so hateful to God and so destructive to us, God did something about it. What did God do about SELF ? 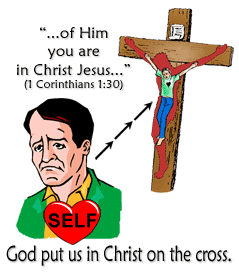 God dealt with SELF by putting us in Christ on the cross. When Christ was crucified, we were crucified with Him. 2) we died with Christ. The great truths concerning our union with Christ in His death, burial, and resurrection are fully covered in Course 3. An understanding of these truths is absolutely essential to a life of victory. We have seen that the root cause of temper is SELF, and we have seen how God has dealt with it. Now let us see some practical steps that we must take. We must see our need. Many people, when angry, simply will not admit their anger. They say, "I am NOT angry!" Others admit that they have a temper but do not see it as a serious sin. Unless we see the seriousness of our temper and determine to be delivered from it, we will not overcome it. If we are satisfied to go on as we have been going, we will know nothing of God's victory over the sin of temper. We must accept responsibility for our temper. It is very easy to excuse ourselves by blaming someone else for our temper. We say, "If so-and-so had not spoken to me like that, I would not have lost my temper." In other words, we think that our temper is an external problem—that it is caused by something from without. The fact is that temper is an internal problem. Temper comes from within us, not from without. Others may say or do things that irritate me, but no one can make me lose my temper except me. We must count on our death with Christ. We must put God's truth into practice. When we find ourselves getting angry, we can say, "Hold it! I am not acting like the person I really am. I am not the person I used to be. My old angry self was crucified with Christ. I don't have to give in to my temper any more. I am a new creature in Christ. Christ lives in me. He is my life." Whether or not we lose our temper is not determined by what happens on the outside. It is determined by the one in control on the inside. Christ alone has the right to rule in our life, but SELF will still try to rule. Every Christian must choose whether he will be ruled by Christ or by SELF. It is God's purpose that Christ reign on the throne of our heart. 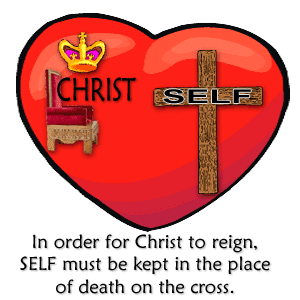 In order for Him to reign, SELF must be kept in the place of death on the cross. To overcome temper, we must deny SELF. What does it mean to "deny SELF"? To deny SELF means to choose God's will instead of our own will. Denying SELF is saying, "I don't have to have my own way. I accept God's way." The world says, "Look out for yourself," but Jesus says, "Deny yourself." We will never control our temper until we give up our way and choose God's way. We will find that the Lord will allow us to be in many situations where we are slighted, mistreated, or inconvenienced. This is God's way of dealing with our self-life and our temper. God's purpose in all these situations is that we learn to be patient and self-denying, gladly letting God have His own way in our life. When someone keeps you waiting a long time, you do not have to lose your temper. 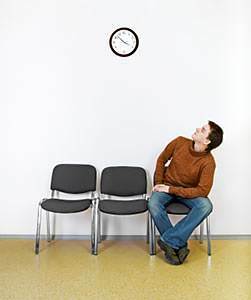 You can say, "Lord, You know that I need to learn patience. You are in control of my circumstances, and You have allowed this to teach me to be more patient." When someone says or does something that hurts your pride, you don't have to get angry. You can say, "Lord, You know how proud I am. I thank You for dealing with me about my sinful pride." When others do not do what you want them to do and you cannot have your own way, this is your chance to die to SELF. You can say, "Lord, I always want to have my own way, but You know what is best for me. I accept Your way." In whatever situation the Lord arranges for us, we can say, "Lord, this is what You have arranged for me. This is Your way of dealing with my self-life and my temper. I accept this from You and thank You for it."